The line number is 1594, isn't it? This line initialized an array. The code is valid, i.e. as of PHP 5.4 you can also use the short array syntax, which replaces array() with . Can you provide the full error message? I thought the PHP or SQL version could be the issue. I will change the php to 5.5, all should be OK after that. I upped the PHP to 5.4 and 2.4.8 installed with no issues, Thank you for the help. 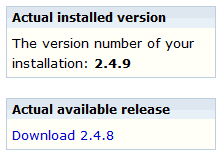 Err, where do you read from version 2.4.8? Is it the field in the last row in the advanced-settings-page? Is it the HTML-source of a page header (right click in the page=>context menu=>show source code)? Or it it in the admin panel, where two issues with the upgrade message came up? Is it this what you see? You are correct, I must of extracted the 2.4.8 zip files into the 2.4.9 folder.